It has official been 9 months since I create my birthday list. 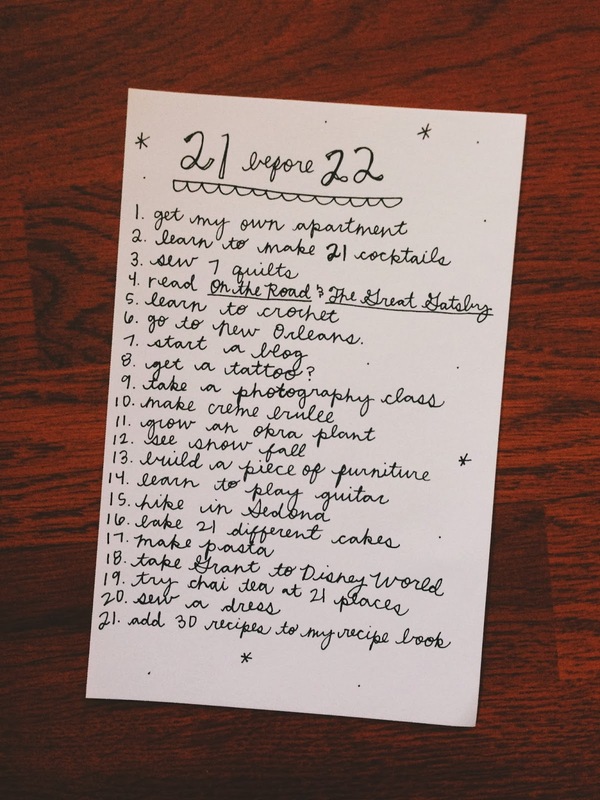 The idea was to make a list of 21 things to do before I turn 22. 2. only made one cocktail. 4. read The Great Gatsby. 10. made creme brulee and it was tasty! 11. grew an okra plant. We had more okra than we knew what to do with. 12. didn't see snow fall, but I saw some on my trip with Grant, so it counts! 15. hiked last summer in Sedona with the family I baby sit for. We had a great time. 19. tried chai tea from 7 different places so far! 21. added only one recipe to my book. I may have been a little too ambitious when creating this list, but I am going to try really hard to get as much completed. Even though I haven't done as much as I'd like, I still love this new tradition. I'll post a 10 month update in February! Previous Post Sedona trip with Grant. Next Post applying to study abroad.